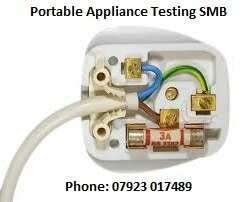 Portable Appliance Testing SMB (Lisburn based) are committed to providing a professional service to the small and medium business throughout Ireland. We provide a fast reliable and professional service covering hair salons, churches, solicitors, Insurance brokers, landlords, educational institutions, prestige tourist attractions and much more. We offer our customers portable appliance testing and microwave leakage testing throughout Northern Ireland and our aim is to meet your needs in terms of creating the minimum disruption to your daily routine. We will work to whatever best suits your business needs and requirements depending on the environment you operate in. At SMB we are committed to providing a polite helpful and effective service to meet our customer needs. We at all times aim to provide a prompt and effective response to all customers requests while operating with integrity and passion for excellence to meet or exceed the needs of all our customers. NO JOB IS TOO SMALL - LET US GIVE YOU A QUOTE. The law simply requires an employer to ensure that electrical equipment is maintained in order to prevent danger. Many types of equipment requires testing at regular intervals to ensure continual safety. The interval between tests depends on both the type of appliance and the environment it is used in. As an employer it is your legally responsible for the upkeep and maintenance of all your electrical appliances. This includes regular inspection and testing.